We’d love your help. 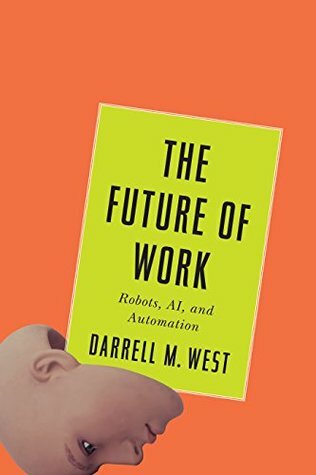 Let us know what’s wrong with this preview of The Future of Work by Darrell M. West. Robots, artificial intelligence, and driverless cars are no longer things of the distant future. They are with us today and will become increasingly common in coming years, along with virtual reality and digital personal assistants. As these tools advance deeper into everyday use, they raise the question—how will they transform society, the economy, and politics? If companies need fewer workers due to automation and robotics, what happens to those who once held those jobs and don't have the skills for new jobs? And since many social benefits are delivered through jobs, how are people outside the workforce for a lengthy period of time going to earn a living and get health care and social benefits? Looking past today's headlines, political scientist and cultural observer Darrell M. West argues that society needs to rethink the concept of jobs, reconfigure the social contract, move toward a system of lifetime learning, and develop a new kind of politics that can deal with economic dislocations. With the U.S. governance system in shambles because of political polarization and hyper-partisanship, dealing creatively with the transition to a fully digital economy will vex political leaders and complicate the adoption of remedies that could ease the transition pain. It is imperative that we make major adjustments in how we think about work and the social contract in order to prevent society from spiraling out of control. This book presents a number of proposals to help people deal with the transition from an industrial to a digital economy. We must broaden the concept of employment to include volunteering and parenting and pay greater attention to the opportunities for leisure time. New forms of identity will be possible when the "job" no longer defines people's sense of personal meaning, and they engage in a broader range of activities. Workers will need help throughout their lifetimes to acquire new skills and develop new job capabilities. Political reforms will be necessary to reduce polarization and restore civility so there can be open and healthy debate about where responsibility lies for economic well-being. This book is an important contribution to a discussion about tomorrow—one that needs to take place today. To ask other readers questions about The Future of Work, please sign up. Imagine the scene: It's 2025 and a school student is visiting their careers adviser. Student: Hey there, so do you have any advice for me in choosing a career? Adviser: Well, we've monitored your performance over the last 13 years of schooling, your interests and abilities and used our software to predict which roles you would be best suited to. Student: Ok, so w If you're into stuff like this, you can read the full review. Student: Ok, so whats the result? I read this as an ePub and so can’t give page numbers for the quotes I’m going to provide at the end. I’m not American and don’t really know very much about the Brooking’s institute – I had assumed it would be a sort of right-wing think-tank, but it clearly isn’t quite that. This presents many of the problems about to overwhelm us and then gives us some options to avoid being overwhelmed – this is mostly concerned with the US, the take away message here, given sub-plot, is ‘expect to be overwhel I read this as an ePub and so can’t give page numbers for the quotes I’m going to provide at the end. I’m not American and don’t really know very much about the Brooking’s institute – I had assumed it would be a sort of right-wing think-tank, but it clearly isn’t quite that. This presents many of the problems about to overwhelm us and then gives us some options to avoid being overwhelmed – this is mostly concerned with the US, the take away message here, given sub-plot, is ‘expect to be overwhelmed’. Basically, if things are to become better then there will need to be major reforms in the US political system and also in its welfare system – so that people aren’t crushed for the outrageous crime of being poor. That none of these reforms are even remotely likely might be enough to stop you reading this book -which would be a pity, but quite understandable. None of this would matter if the US didn’t have nuclear weapons, but it is a nation that is very unlikely to crumble and fall all on its own and given its preference for violence as the solution to all problems, we in the rest of the world can only watch on through the gaps in our fingers as they cover our faces. I have only drawn quotes from the first two-thirds of this, since the end is mostly concerned with US politics, and that is all too depressing for words. “The U.S. Bureau of Labor Statistics (BLS) compiles future employment projections. In its 2015 analysis, the agency predicted that 9.8 million new positions would be created by 2024. This amounts to a labor force growth of about 0.5 percent per year. Figure 4-2 shows the distribution by sector for the period 2014 to 2024. The health care and social assistance sector is expected to grow the most, at a projected annual rate of 1.9 percent, or around 3.8 million total new jobs over the decade. That is about one-third of all the positions expected to be created.15 Other areas that are likely to experience growth include professional services (1.9 million), leisure and hospitality (941,000), construction (790,000), trade (765,000), state and local government (756,000), and finance (507,000). - AI and automation will replace a lot work in the economy. - The current political climate does not make these sweeping changes likely — if possible at all. - This is due to a small number of rich people holding enormous sway in people in office. - If we have campaign finance reform then the problem becomes easier. But the question is “now what”. If some of the 0.01-percenters are willing to spend billions of dollars a year to maintain their special interests, how do go about getting campaign finance reform? This book is poorly written and borders on intellectually dishonest. The explanation of AI, robotics, and automation is equivalent to what you can glean from skimming headlines. It is less than half of the book, and heavily padded with unrelated statistics. The author fails to identify how different types of jobs will be affected in any detail. While the author can't know the future, I expected some investigation. The balance of the book is made up of the author's proposed solutions, which fall i This book is poorly written and borders on intellectually dishonest. The balance of the book is made up of the author's proposed solutions, which fall into two categories: the government providing income, and the government providing re-training. The ideas around government providing income seem to fundamentally misunderstand what money is, and why it has value. The government making money available for re-training people whose jobs were lost to technology is problematic because the author has failed to investigate which types of jobs are likely to be lost, which will remain, and how many there will be. Will there be anything to re-train people to do? Will many people have the aptitude for the jobs that remain? ♡♧Today's reading, The Future of Work by Darrell M. West on Blinkist was very insightful. I could easily relate as an AI- Robotics enthusiast as my postgraduate works were along these lines. Darrell takes a good look at the nature of Work and how it is currently evolving. The Author looks into Artificial Intelligence, Automation, machine learning, internet of things- IoT and how they are currently affecting work, life and living. In a nutshell, work processes are already being automated, many peopl ♡♧Today's reading, The Future of Work by Darrell M. West on Blinkist was very insightful. In a nutshell, work processes are already being automated, many people will lose their jobs, more new roles or opportunities will be created in no doubt newer paths for instance healthcare will benefit immensely. There will be no routine jobs with higher pay, because less robots can take on more of such jobs with minimal cost to organizations. Though AI has lots of advantages, yet, It is not without its own challenges too. Dreams, Imaginations or projections along these lines decades ago are already reality today. This is a very well-researched study on how automation and robotics will shape the future of work and the social contracts that define today’s society. I read several other books on the subject including Martin Ford’s two excellent books; and this one has some very cogent insights on the political implications of technology that I had not seen mentioned in others. Highly recommended to everyone with an interest in what awaits us in the dawn of AI. An excellent, well researched and well-written book on the future of work and the issues that will face us as a society as we navigate this next technical revolution. If you are interested or concerned about how technology, robotics and AI are going to affect our jobs, life and society this is a great book to start with. Packed full of relevant stats and research, I raced through my copy in 2 days and it was full of tape flags by the end. A truly disappointing compendium of half baked ideas from someone who clearly believes the government is the solution to all problems. Given the government’s track record, their likelihood of coming up with viable solutions is slim. This book presents nothing new and does a really bad job of defining the problems we will face. A true waste of time. There is not much in the book that is insightful. West covers the familiar territory if automation and the polarisation of american politics. It made some good points, but it sounded like it was advocating for socialism. A little too jargon-y for my taste (the terms weren't always well-defined). And despite West giving possible solutions, I felt a bit hopeless after reading this -- how do we get our politicians to understand these issues and cooperate to find solutions? Still, a good overview to help folks think through the things that are coming our way.